I did a marathon sprint with Amagami SS and finished the whole series last night. I thought I should write up my thoughts about the show while it’s still fresh in my head. 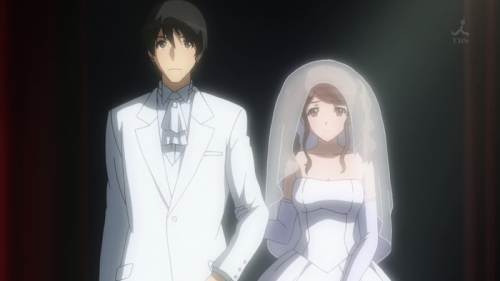 Amagami SS is a typical bishojou game to anime conversion in many ways, but in others it is quite unique. Most galge conversions (at least all that I’ve seen) only cover one girl’s arc (and maybe a second girl’s in an OVA). Or they take some time off the main route to focus on another girl for maybe 3-4 episodes. Amagami SS takes the unusual approach of having a 4 episode arc for a girl in its entirety, then doing a reset so Junichi can get with another girl. Don't you wish your girlfriend was narcoleptic like me? I think this forces the anime to be a little bit more self aware as it needs to concede to the fact that alternate realities are going to pop up. In a pseudo Back to the Future / Groundhog Day way, we see how Junichi’s actions (and inactions) affect those around him. In a way, it’s really sad to see alternate futures, because Junichi seems a pretty integral part of some of the girls’ lives. I saw you with five other girls! 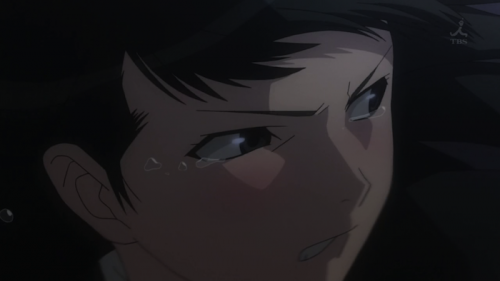 Another thing that bothered me was how Junichi could be right for all of those girls. Obviously this guy is a man whore himself. I never noticed him saying anything like, “you’re the only one for me,” since that would have set off the fourth wall alarm. The final episode pokes fun at the causality of Junichi daing all the girls by having a final girl who meddles with his relationships. He just goes from Morishima to Kaoru to Sae to Ai to Rihoko to Tsukasa, just like the series progressed! 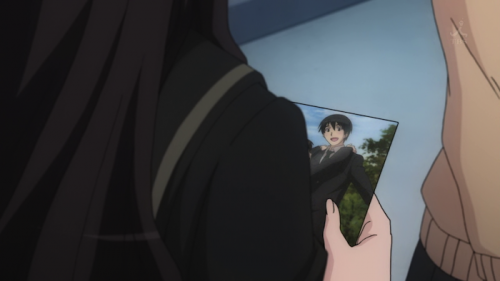 All analysis aside, I really enjoyed Amagami SS. There were a slow arcs, but towards the end I couldn’t stop watching. The Tsukasa arc finally brought what the series what it needed all along: some actual drama. There was finally a character who you didn’t quite understand, who had surprisingly more to her than first glance, and who might’ve been a bit dangerous. I suppose it was the series quick 4 episode arcs that enabled me to finish, but I also enjoyed the characters and the humor in the how. The arcs themselves could have been done better. There were too many untied loose ends, like Ai’s little brother and Tsukasa’s book (and secret?). Overall, it was a fun show that was easy to take in small chunks and had a really interesting few final episodes. These days I hardly finish any anime, so it’s a pretty good indicator that I got all the way through this one. Well, that takes care of Angel Beats! After getting rid of the smoke monsters, Yuri wakes up and everyone has already moved on. Way to thank your fearless leader, guys! The only ones left are Otonashi, Hinata, Fake Potter Guy, Yuri and Kanade. Well, that takes care of Angel Beats! After getting rid of the smoke monsters, Yuri wakes up and everyone has already moved on. Way to thank your fearless leader, guys! The only ones left are Otonashi, Hinata, Fake Potter Guy, Yuri and Kanade. They have a fake graduation ceremony and then “move on,” one by one. I have a feeling the ceremony would have had a greater effect on me, had I graduated from a Japanese high school. They really sing school theme songs and that one universal Japanese graduation song? It seems like fate is nice in this series, and everyone gets reincarnated and gets to live a happier life the next time around, as shown in the epilogue. All’s well that ends well, I guess (which is hard to determine with reincarnation). Angel Beats kind of reminds me of a Japanese film called “After Life.” It also features a pretty mundane afterlife, though with a twist on “moving on.” You should check it out if you liked Angel Beats! 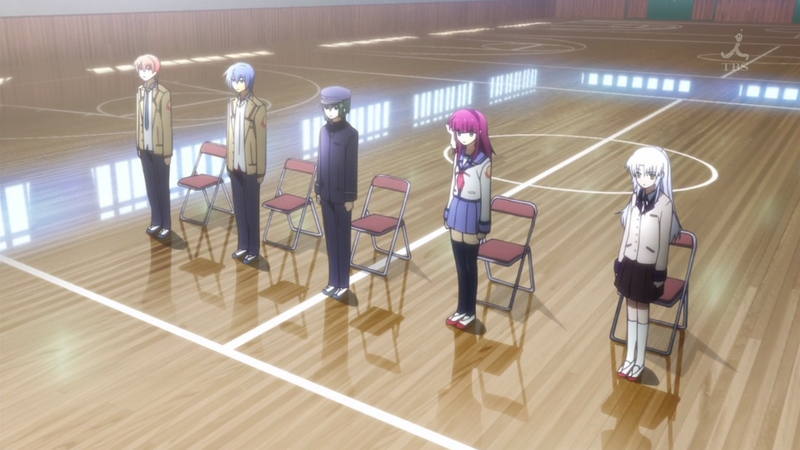 Overall, Angel Beats was pretty darn good. It’s the first anime that I’ve followed on a per week basis regularly and actually finished. I feel it could’ve worked well as a longer series though, since many of the characters had no backstory at all, and so their personalities just seemed forced with no reasoning behind them. And what was up with TK? I guess we’ll never know. Unless there’s a spinoff. A while back, I reviewed a movie called “Big Dreams Little Tokyo.” The director just released another film, “White on Rice,” and sent me a review copy. White on Rice is another story about Asians in America, though this one is not centered on an Anglo protagonist. Jimmy is a man-child who lives with his sister and her husband and child. He was recently divorced, and apparently is planning on moving out once he gets remarried. The problem is that Jimmy isn’t exactly marriage-material. He goes on a ton of dates, focusing on women in the office he works. First observation: Jimmy – you’re doing it wrong! Never go for the office romance! Things get more complicated when his sister’s friend(?) Ramona moves in for college. Jimmy decides to go after her, causing scene after scene of awkwardness. There are also a few subplots involving Jimmy’s sister and her much older husband and their nerdy little kid. The kid, Bob, does not speak Japanese like the rest of the family. As a first (or second, depending on how you classify it) generation Asian American, I totally see this kid in most of my cousins who were also born in America. Bob is studious at school, has numerous part time jobs and pretty much fades into the background when his parents are around. He’s probably the most entertaining character since he’s so dead-on stereotype but also very real. Jimmy, on the other hand, is sort of less believable. How did he get married in the first place? What led up to his divorce? He’s about one step away from being Pee-Wee Herman in his man-child behavior. I can’t decide whether to like him or whether to think he’s extremely creepy. He’s kinda mean to his super tall date, and he also totally ignores a girl in a banana costume who really likes him. He also stalks Ramona while she’s dating someone else. Granted, the guy she’s dating is a douchebag Asian (note to women, this is the wrong kind of Asian man to date), but still. I think Hiroshi Watanabe really shows his skill in acting, since he can play this socially inappropriate dude and get away with it simply because he looks so innocent when he flashes that smile. Some of the acting is a big rough. I can’t tell if Hiroshi Watanabe is speaking broken English on purpose for his character, or because he’s really not that good at English. It’s kind of like how it seems like Jackie Chan doesn’t really know any English at all in his movies and basically speaks the syllables he needs to in order to fake it. I had to rewind a few times to understand what people were saying. This is bad, because I should technically be pretty good at deciphering Asian accents (my parents have strong accents). Besides the language barrier, I thought the movie was really funny most of the time. The thing is that the actors all seemed sincere in what they were doing, even if what they were doing seemed just plain wrong. I also had a few issues with the pacing of the movie, especially towards the end. Some random character appears out of nowhere and saves the day with his car. I don’t recall seeing him earlier in the movie. Maybe I just wasn’t paying attention? There were also random plot holes here and there, but that’s to be expected when you have a bunch of overarching plotlines and a short amount of time to tie them all in. A fun easter egg that I noticed was in a funeral home scene. Bob goes to play the piano by a dead guy. The dead guy looks like Boyd from Big Dreams Little Tokyo. In the credits, the young corpse is listed as being played by “Boyd Wilson,” who is the character that Dave Boyle played. So he got a small cameo in his movie. It’s kind of sad to see that Boyd died so young. Hopefully the sumo guy realized his dreams. One detail that I appreciated was that the native speakers spoke to each other in Japanese. It always confuses me when two people who can communicate with each other in their native language, when it’s just the two of them, decide to speak in broken English. Tim (the douchebag Asian guy) even makes a note that Bob doesn’t speak to his parents in Japanese, though he can understand them when they speak to him. It’s a small touch, but makes a difference when it’s something that is culturally obvious. I don’t think that anyone would argue that there are too many movies on Asian American culture. Any addition to the genre is quite welcome, and when it turns out to be funny and genuine, that’s a major bonus. I originally thought the storyline was going to be about an Asian guy going after a white woman because of the title. “White on Rice?” I think it would’ve been a more interesting story that could’ve highlighted culture clashes and brought up more about Asian American self-identity. Jimmy could’ve totally used this book. While I think it plays it a bit too safe, White on Rice still serves as a voice for the underrepresented minority of Asian Americans. I think it’s an important step in showing that Asians can star in movies that don’t have the word “ninja” or “kung-fu” in them. Overall it’s a solid Asian American indie movie that’s fun, uplifting, quirky and charming in its little imperfections. 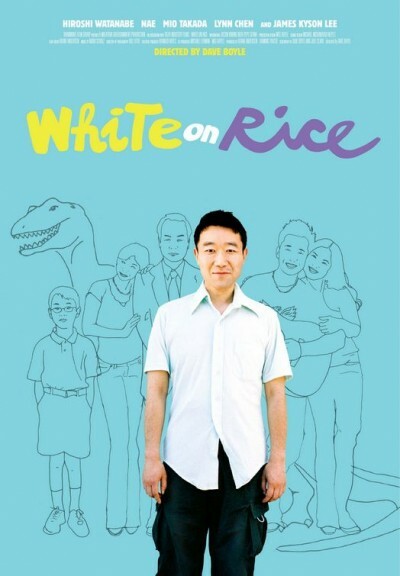 White on Rice hasn’t had a wide theatrical release yet, but it has shown up in some film festivals. Apparently you can buy the movie already for a “sneak peek.” Hopefully it gets a wider release at some point. You can get more info at the official website. I heard about Solanin twice in the course of a week or so (once at a staff pick section in Barnes & Noble and another from a Twitter feed) so I figured I would get it from the library. College graduates struggle to cope with the real world. 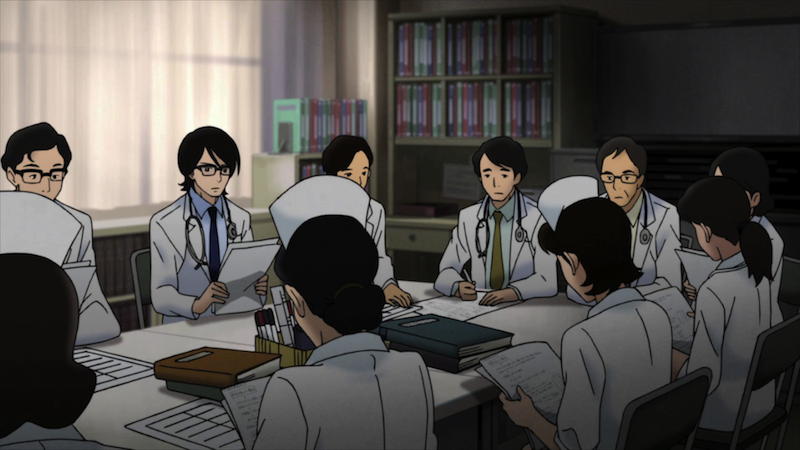 Music offers refuge in this modern manga with an American attitude. Meiko Inoue is a recent college grad working as an office lady in a job she hates. Her boyfriend Shigeo is permanently crashing at her apartment because his job as a freelance illustrator doesn’t pay enough for rent. And her parents in the country keep sending her boxes of veggies that just rot in her fridge. Straddling the line between her years as a student and the rest of her life, Meiko struggles with the feeling that she’s just not cut out to be a part of the real world. 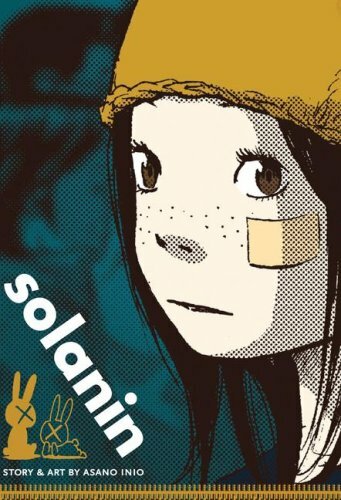 I think Solanin (ソラニン？）sets really high expectations and ultimately fails to deliver on them. There are lots of characters, all with unique backstories, but the interesting ones (non main characters) get pushed aside for the main plotline which I found kinda dull. Temporally, the manga is really confusing. Manga typically signify a flashback via black borders around the edges. I couldn’t tell what was a dream, what was a flashback and what was happening in “real-time.” I’m still not really sure what happened in the story. Maybe that’s intentional? This book is definitely relevant to my interests as a mid 20-something going through a quarter life crisis. I have a feeling it would be more relevant if I was living in Japan. There are a number of cultural references and it’s hard to pick up on them if you don’t know about Japanese culture. For example, the job of Office Lady (OL) doesn’t really exist in Western culture. Meiko is fighting against that culture of working at an office to find a hard working husband so she can quit. From a Western perspective, I think Japanese feel more “trapped” in their system than many of their Western counterparts do. I think this is a first attempt from the author. In that case, it’s good, but the amateurishness of it definitely shows as well. Solanin shows promise, and it isn’t bad, but I feel it could have been a lot better.